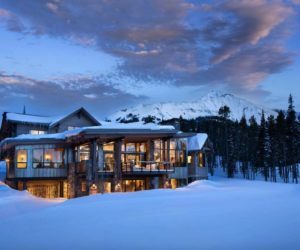 Some things are meant to be recycled and repurposed. 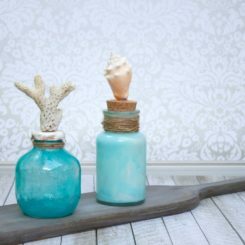 For example, Mason jars fir nicely in this category. But other things come as a surprise. 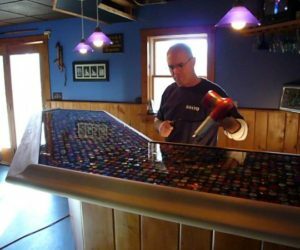 It’s not everyday you see someone collect bottle caps for a DIY project. 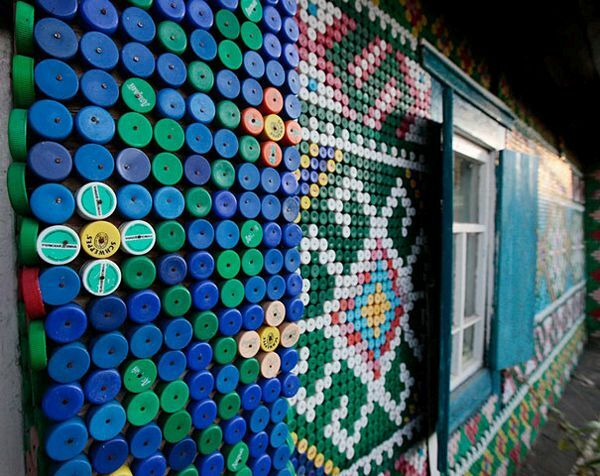 There are in fact plenty of fun and interesting uses for bottle caps and we’re really excited to have a look at some. For the project featured on Touchoftay you’ll need a whole bunch of bottle caps. The idea here is to glue them onto a table to cover the whole top. Depending on how big the table is, you can calculate how many caps you’ll need. After you figure out the design and pattern you need to put a layer of epoxy onto the table surface. Put the caps on top and let the epoxy dry. Then apply another layer over the caps. 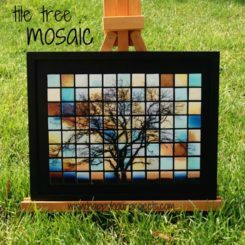 A similar project is also featured on Mysocalledcraftylife. 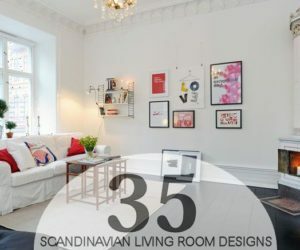 In this case an Ikea Lack side table was used but you can pretty much use any table you want. Perhaps you’d like to give an old table a makeover. 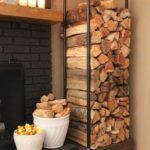 In any case, you’ll need a lot of bottle caps, some plywood, heavy duty adhesive, a glue gun, nails, a saw, paint, tape, grout, a bucket, a sponge, screws and screwdriver. 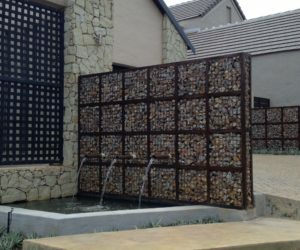 You would also need quite a few bottle caps to make a wind chime, especially if you want it to look like the one on Ephemeralalchemy. You’ll need something to attach all these caps to and that something can be anything from an empty can to a colander or a box. 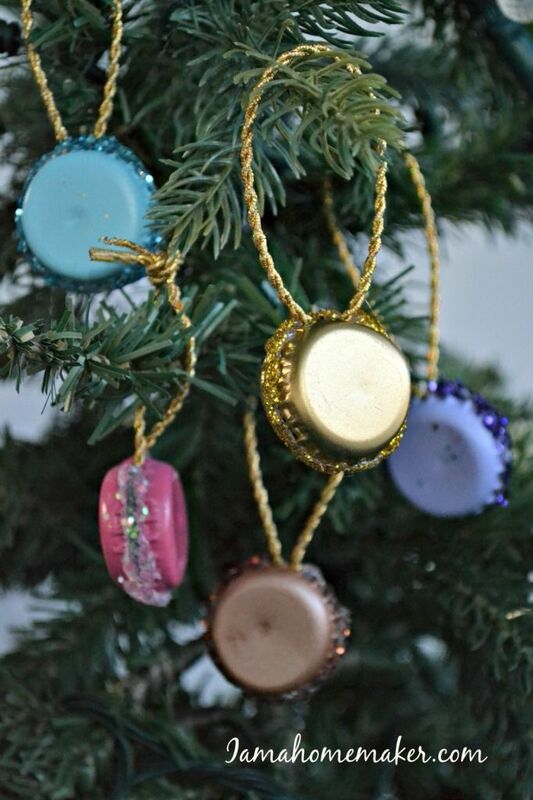 Attach your bottle cap chains to it and make the chime as long and as full as you want. 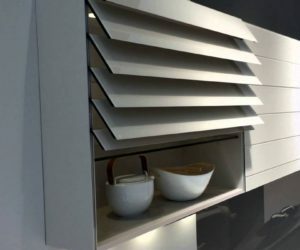 Doesn’t thick backsplash look mesmerizing? We found it on Markmontano. 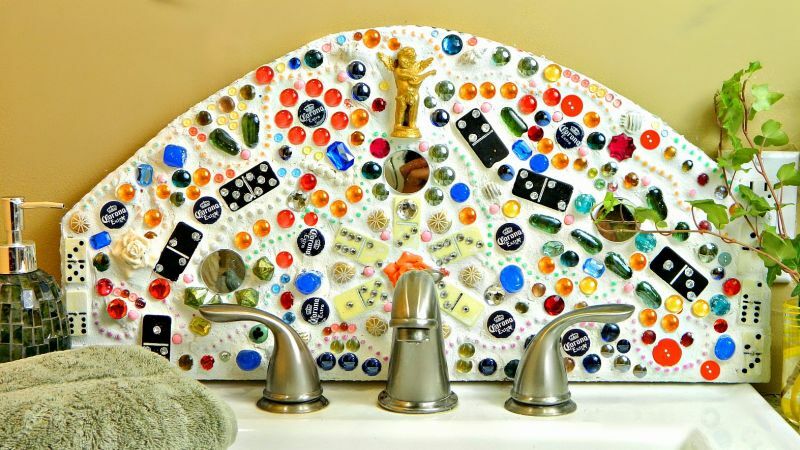 It was made using the following: plywood, grout, glue, beads, dominos, gems, bottle caps, tiles, seashells and small mirrors. 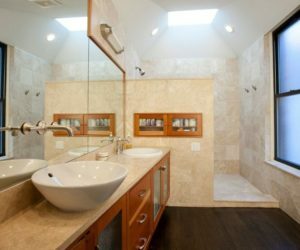 You can make something similar for your own kitchen or bathroom. 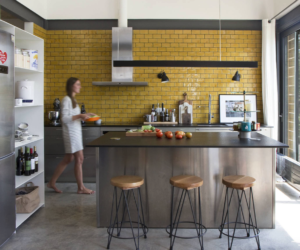 Just gather some small ornaments you want to embed into the backsplash and figure out how you want to arrange them. 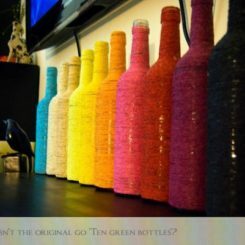 Another interesting way to repurpose your large collection of bottle caps is described on Markmontano. 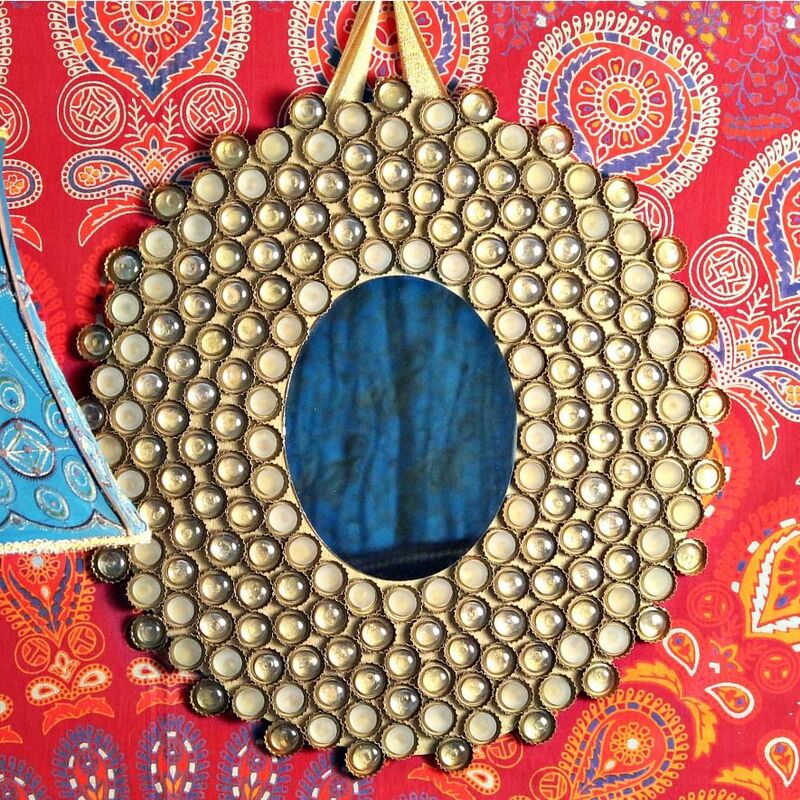 This time the project is a mirror frame covered with lots of bottle gaps. 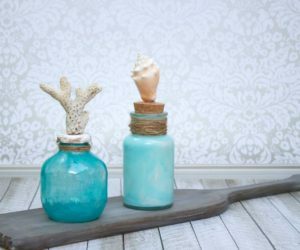 Here what you’ll need for a similar project: metallic paint in antique brass, glass floral marbles, a round or oval wood board, glue, bottle caps and a mirror. 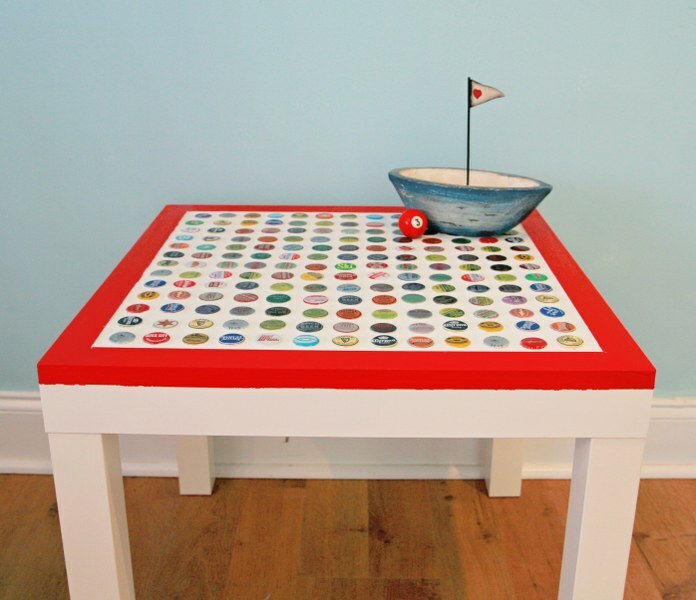 Paint the wood, center the mirror and then start gluing the caps and beads onto the wooden base. Then paint them and hang the mirror. You don’t necessarily have to spend a lot of time arranging all the bottle caps you’ve gathered. You can just display them all in a pile inside a shadow box. 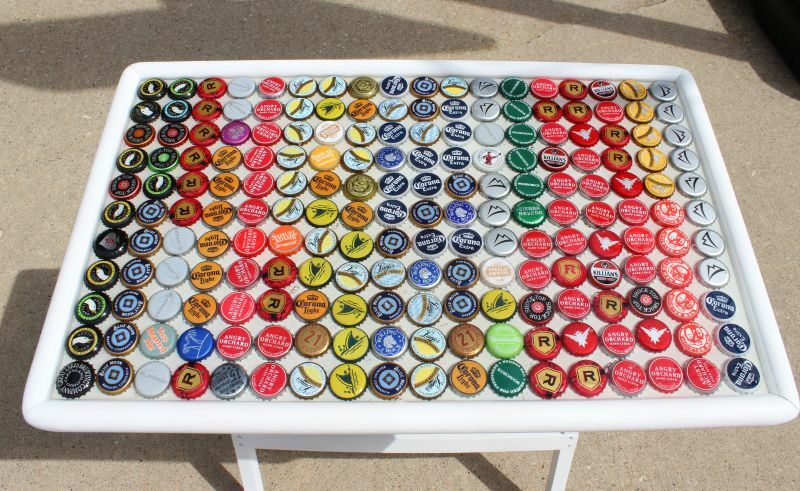 This can be your bottle cap collector. Make it yourself or purchase a ready-made one. 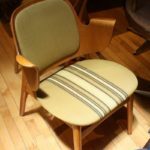 We found this particular one on Craftbeerhound. 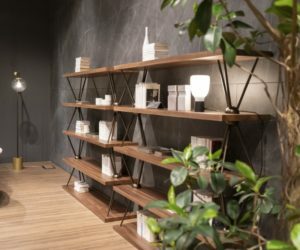 It has a simple and straight-forward design and you can place it wherever you want. Of course, not all the projects we found require large amounts of bottle caps. For some of them you only need a few caps. 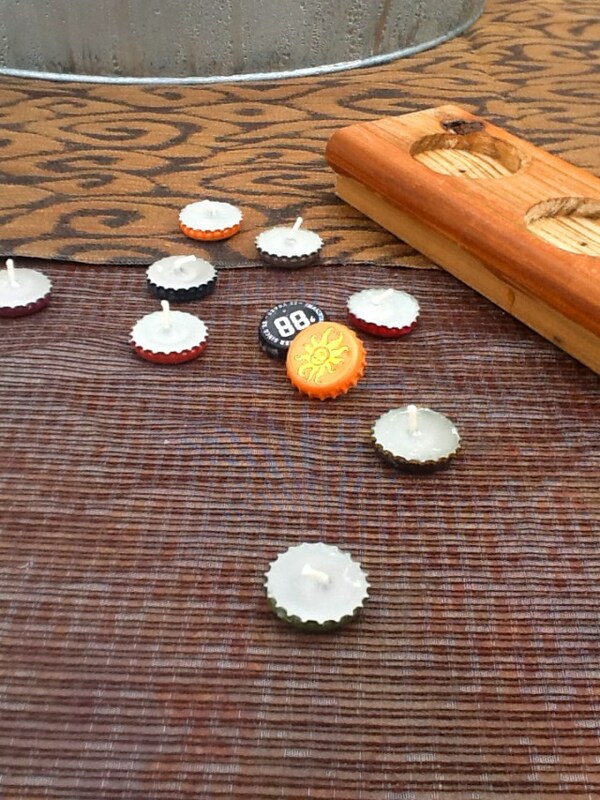 For example, check out Francoisetmoi to find out how to make bottle cap candles. Each cap becomes a tea light candle after you pour wax in it. Don’t forget the wick. Or perhaps you’d like to make some really cool bottle cap magnets. 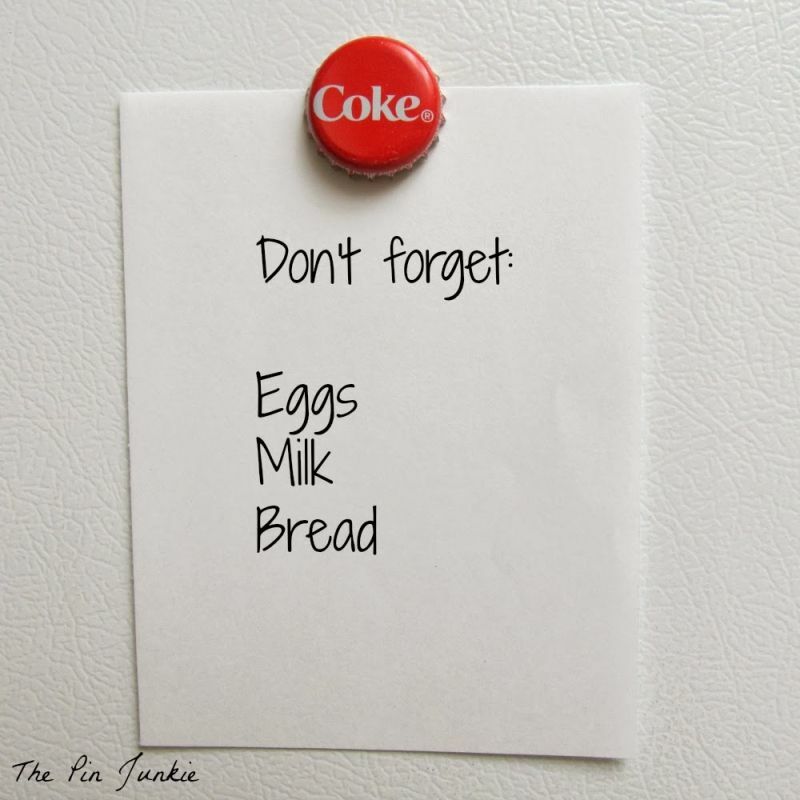 You can display these on your fridge or on any other magnetic surface. 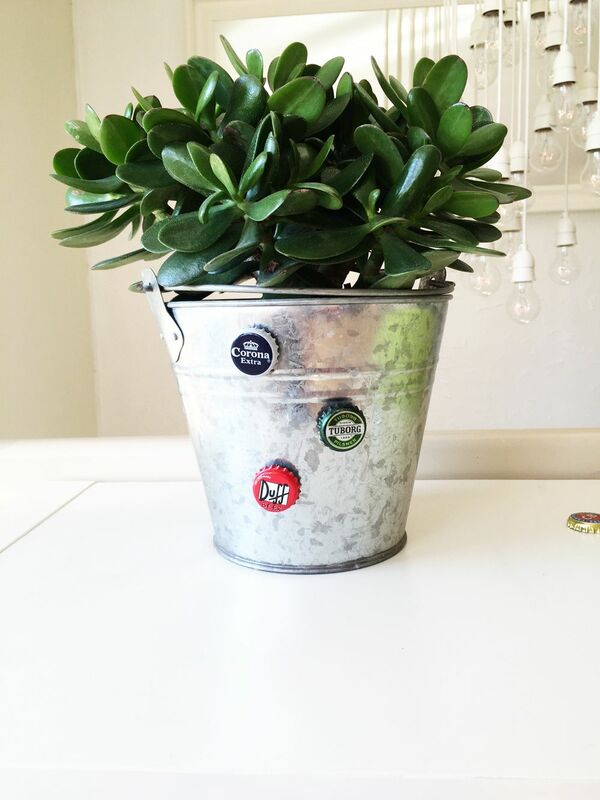 All you need to do is glue a round magnet on the inside of each bottle cap. Let the glue dry and then they’re ready to be used. 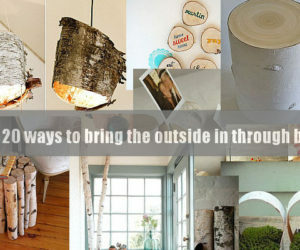 We found this fresh idea on Morningcreativity. 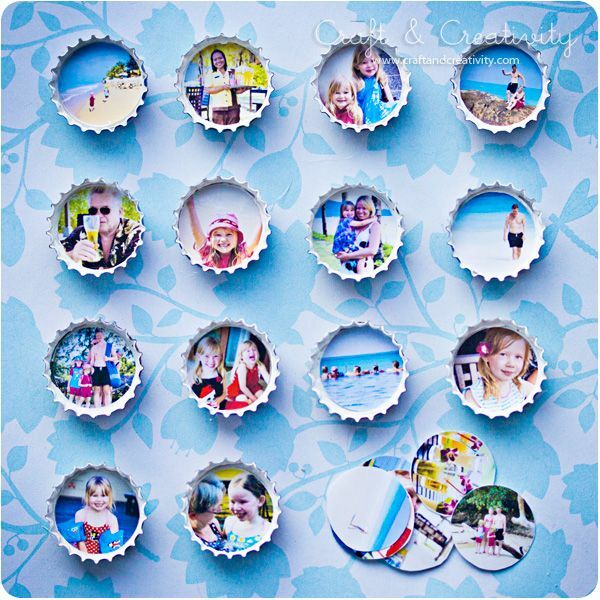 You can also check out some interesting bottle cap magnets on Thepinkjunkie. 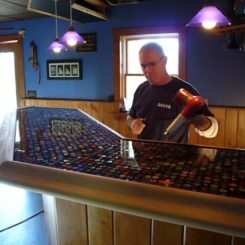 You can use any kind of bottle caps for such a project. Just make sure you also find the right type of magnet for each kind. It’s actually a really cool idea. 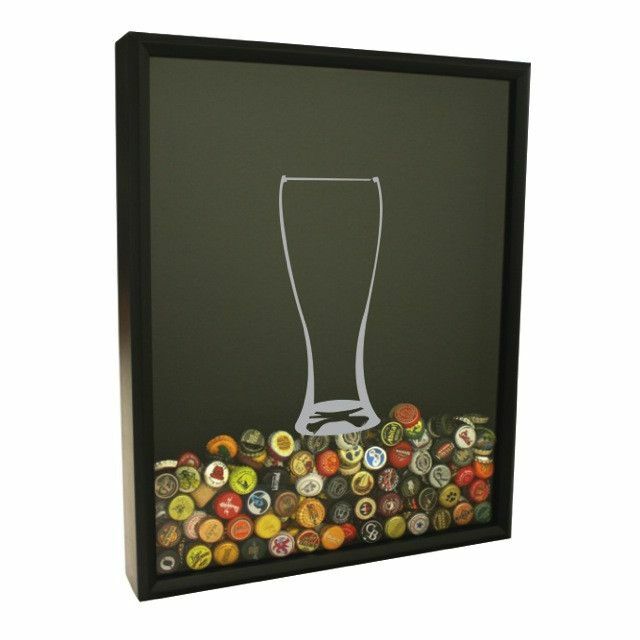 You can make your own collection of iconic bottle caps and display them all in style. 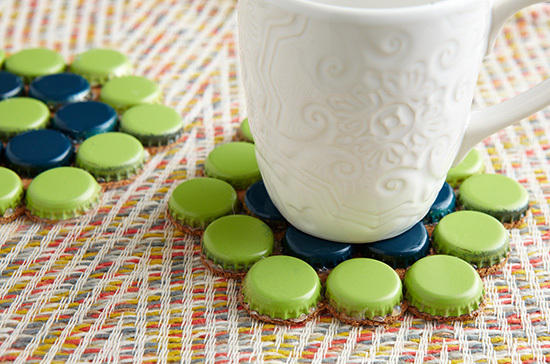 Another thing you can make out of bottle caps is a coaster. That’s actually a pretty useful project. There are several different ways in which you can craft these things. 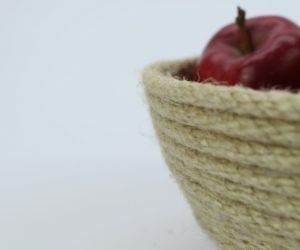 You can use cork coasters or felt or even fabric. Find out all about the project in the description featured on dollarstorecrafts. You can even make something fun for Halloween using some bottle caps you have lying around. 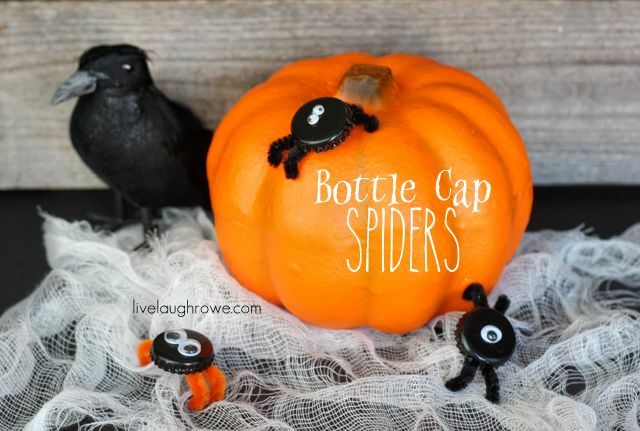 They can each become a cute little spider decoration. Here’s how you transform them: take some pipe cleaners and cut them into smaller pieces. Paint the bottle caps black and place them face down. Then attach the pipe cleaner legs to the cap using glue. At the end add the googly eyes. You can find a more detailed description on Livelaughrowe. 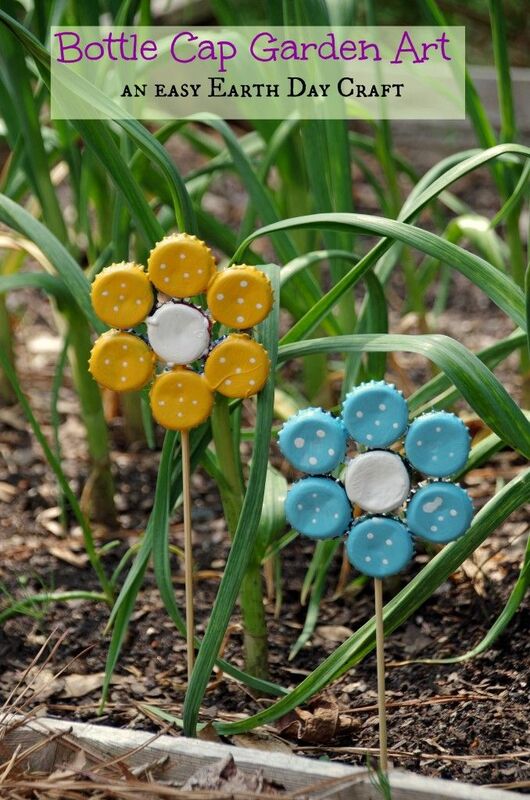 Take the fun out in the garden and make some lovely bottle cap garden art. You’ll need seven metal bottle caps pet flower as well a wooden skewer, some paint, a paint brush and glue. Arrange the caps face down to form a flower and then hot glue them together. After that, glue the skewer to the back of the flower. When the glue is cool and dry, paint the flower. 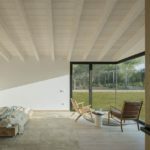 Check out the project on Suburbia. 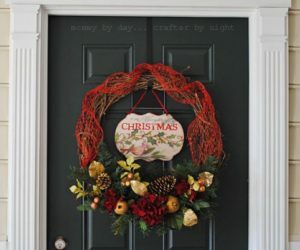 We also found a cute Thanksgiving craft on Thecountrychiccottage. 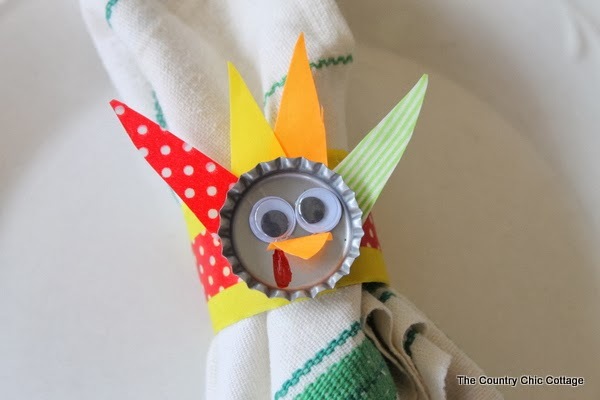 These turkey napkin rings are pretty easy to make and each requires a bottle cap, some washi tape, googly eyes, a sharpie, a glue gun and scissors. You’ll also need a paper towel roll. 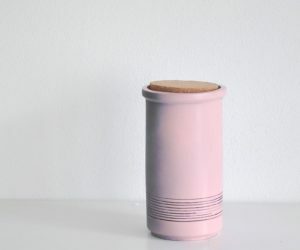 Cut the roll into sections and wrap washi tape around it to make it look nice and pretty. Then fold some tape and cut it to make the colored feathers. Glue the feathers on the back of the bottle cap and then add the eyes and beak. 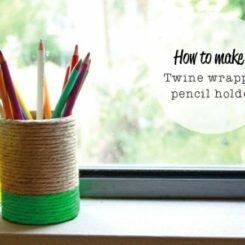 Draw the waddle and then glue the cap to the napkin ring. You could probably make something fun out of bottle caps for every special occasion. 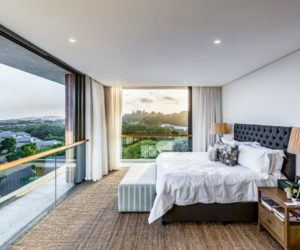 There’s something you can do for Christmas. 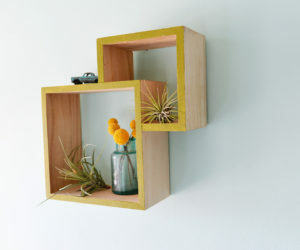 We found this cute project on Makegreat. 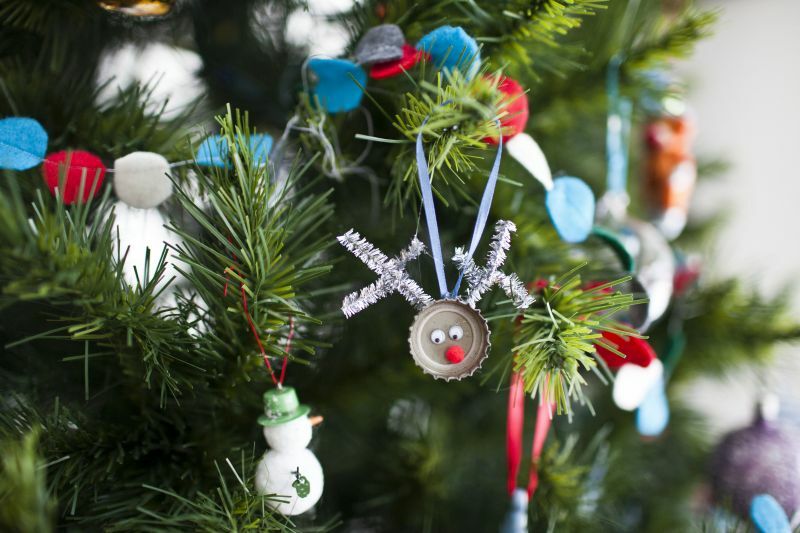 For the reindeer ornaments you’ll need bottle caps, a glue gun, small googly eyes, small red pom poms, pipe cleaners and ribbon. You can also paint the caps if you want. 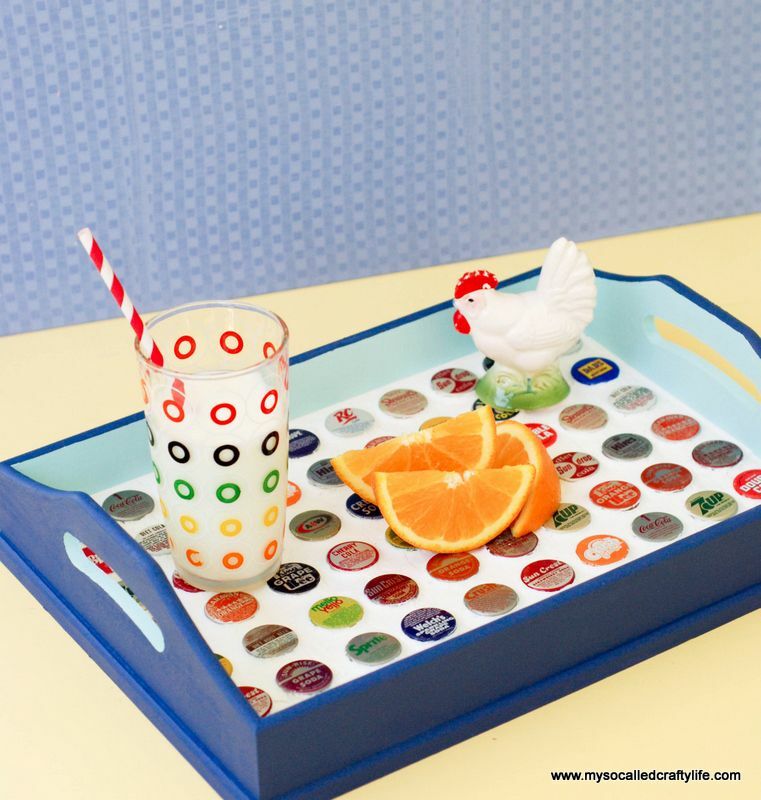 As a craft for everyday use, you could make a bottle cap tray. 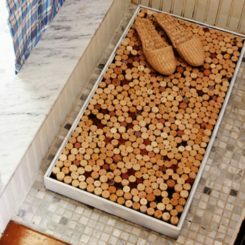 For that you’d need a wooden tray, craft paint, a glue gun, bottle caps, painter’s tape, grout and a sponge. Paint the tray and then Glue down the caps to the inside of the tray. Let the glue dry and then add the grout, covering the caps and making sure it’s level. You can then use the sponge to clean the caps. 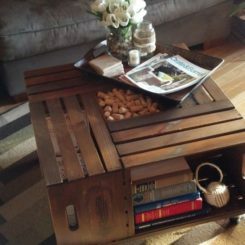 Check out the full description of the project on Mysocalledcraftylife. If you have some nice bottle caps you’re really proud of you could display them all in a frame. The idea comes from Livelaughrowe. 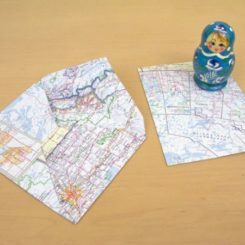 The supplies needed for this include a picture frame, some scrapbook paper, bottle caps, magnets, paint and a glue gun. Remove the glass from the frame and cover the cardboard back with scrapbook paper. Then decide how you want to arrange the caps. Glue them on the board. Then make some cap magnets by gluing a magnet inside each cap. You can now place these on top of the caps you placed in the frame. 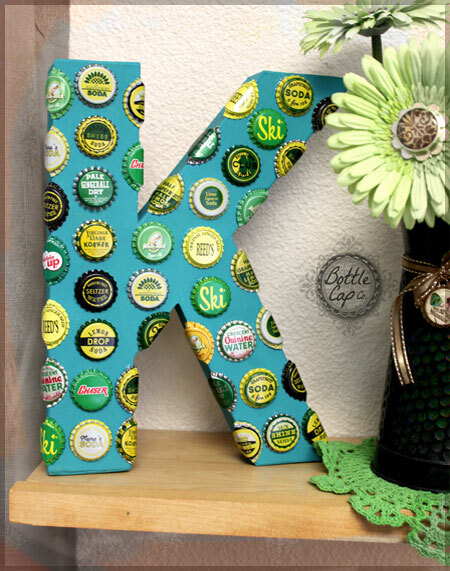 Another project that involves bottle caps and photo frames can be found on Craftandcreativity. This one, however, is quite different. 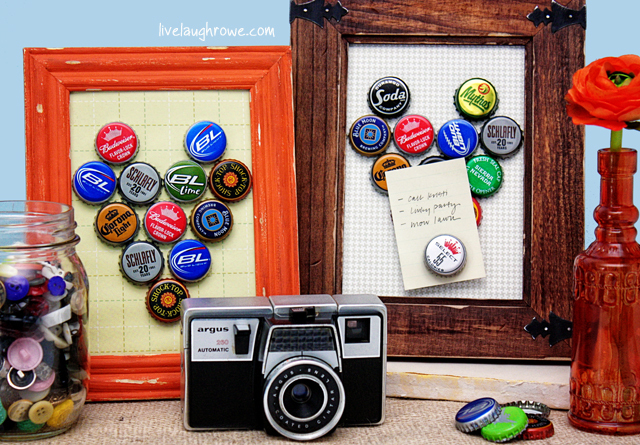 The idea here is to turn each bottle cap into a tiny photo frame. 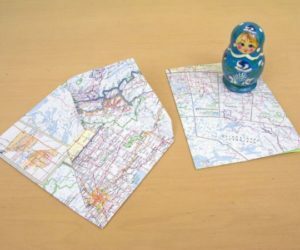 Basically you print out some photos and then cut out small circles which can fit inside the caps. Then you glue them in place. If you want to make something else that’s interesting and fun, check out the bottle cap macarons featured on Iamahomemaker. 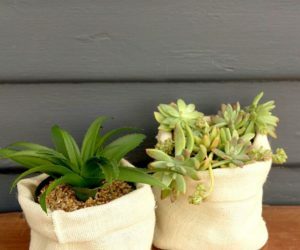 To make these you need spray paint, gold string, a hot glue gun, bottle caps and glitter. The first step is to spray paint all the bottle caps. Use different colors. Then make string loops for each macaron and put it in between two bottle caps of the same color. Glue these together and then quickly sprinkle glitter on the edge. On Kidsstuffworld you can find a project that’s not just lovely but also really thoughtful. It’s a bird house decorated with bottle caps. 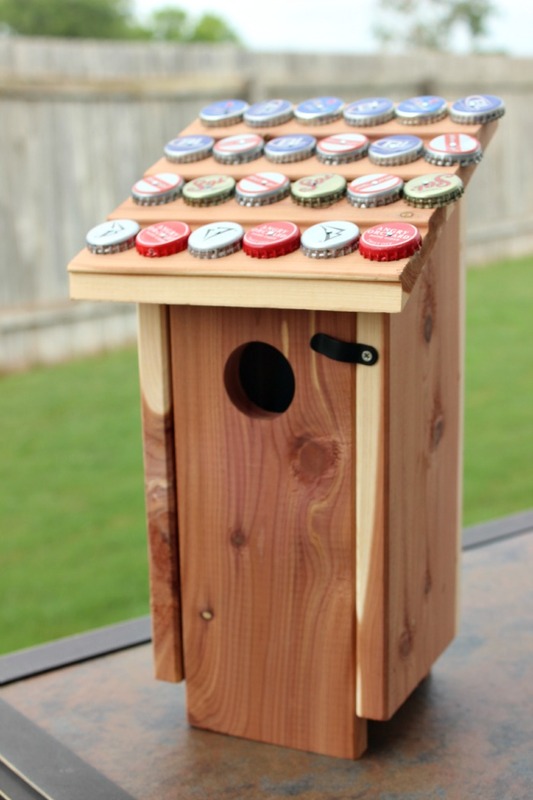 You don’t have to build the bird house from scratch yourself but you can definitely do that if you want. After that take some bottle caps, a hammer and some nails and attach the caps to the roof of the bird house. How about something patriotic for the 4th of July? 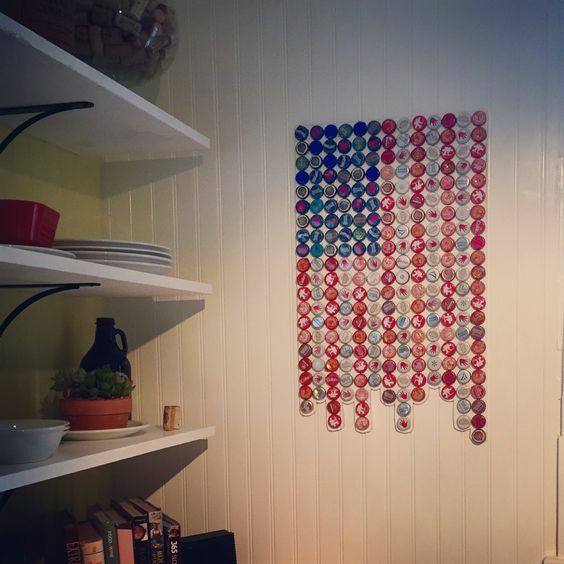 You could make a bottle cap flag. You’d need some bottle caps in red, white and blue. 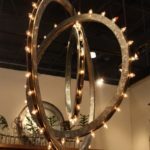 You can arrange these in the shape of the American flag and display them on a wall or glue them onto a board and use that as a freestanding decoration. 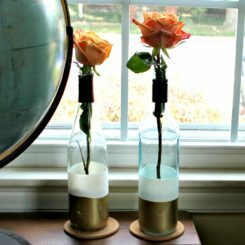 If you’d like to make something vintage to decorate your home with, perhaps the project featured on Bottlecapco would be a nice option. The list of supplies needed for this project includes a bit craft letter, some bottle caps, glue and craft paint. First of all, paint the letter. Let it dry and then lay out the caps on it to get an idea of how the final design will look like. When you’re happy with the design, start glueing the caps to the letter. You can bend some so they fit on the edges. Some people take bottle crafts very seriously and come up with some really extraordinary creations. 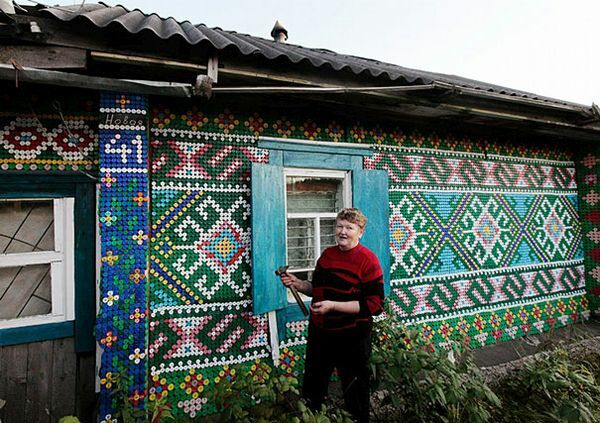 So we’ll finish this article with some images of a house that was decorated with lots and lots of bottle caps. These are actually plastic bottle caps which are usually simple and easier to coordinate and use in complex projects such as this one. 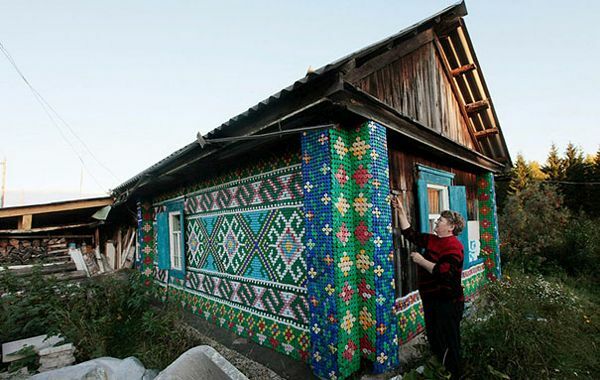 Found out more about this house in Kamarchaga, in the Siberian taiga from the article on Enpundit.